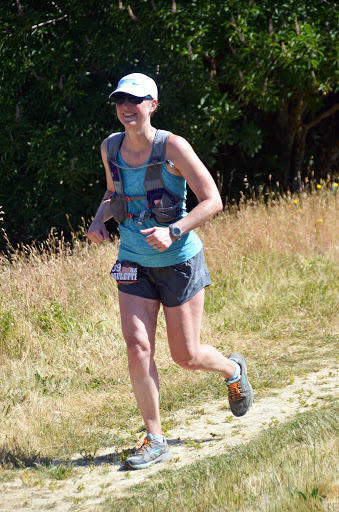 Yesterday I ran the Wildcat trail half marathon as a fun trail run. 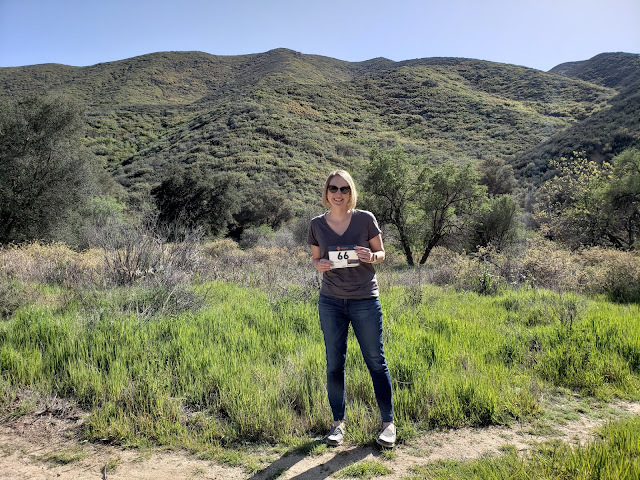 I always love running on new trails and enjoying the race spirit, and I signed up partly because I've always wanted to try a Brazen Racing event. All I can say is - what a fantastic race company! The race was well done with great food, nice shirts, awesome medals, and even free photos. I most definitely didn't go at this as a race and had my slowest ever trail half finish time, but I'm glad I did it. The run was in Wildcat Canyon in the East Bay, about an hour from San Jose. The 8 am start time made it easy to drive race morning without being super tired. They had $5 parking by the race start, the money going to the school at the staging area, and we could use the school's indoor restrooms too. We picked up our race bibs and shirts that morning and got ready to run. The start was low key, a few announcements on the course markers and off we went. The course was almost entirely exposed fire road with a little bit of tree cover somewhere in the middle. The tree cover section was wonderful, smooth trails and lots of fun. The rest was another story. Even though I've run trail half marathons with a similar climbing distance, this one felt really, really hard to me. One reason is that the climbs were steeper both up and down, so there was even more walk climbing going on than in other races. Even a lot of the downhill felt too steep to run without falling down the hill or hurting myself; honestly, I'm not sure how some people ran those downhills. You know it's steep when you see people side-stepping. The real problem that made it so tough was the condition of the trail. It was bumpy, grassy, and had lots of ruts, so landing was hard on the feet and joints. In the last few miles my feet just hurt from the bumps and ruts. I'd also come really close to a bad fall (luckily caught myself somehow) when I jammed my left toes into a rock, making that foot feel like a complete mess for the last 6 miles. Posing for the photographer near the end. So tired. The course had some great parts too. The views from the top were spectacular - San Francisco, the Golden Gate Bridge, other surrounding cities. There was a nicer trail section along the top ridge for a mile or so in the middle that basically gave you a 360 degree view of the area below. The tree cover section was enjoyable and had a stream crossing. The weather was pretty good at the beginning, but it warmed up a lot in the sun and was hot by the end. After what felt like a never-ending climb and some really painful downhill in the last few miles, I finally found the finish line. I'm not happy with my time and think I should have been able to do better, but I also know I had a really tough training week before this one. I'm pretty sure the hard hill repeats, which I was still feeling on Saturday, didn't help my climbing speed. My glutes were way more fried than they should have been after the first big climb. All in all I finished and that's what counts, even if it was a trail half marathon worst at 3:03:31. Onto the race itself. As I mentioned, it was my first one with Brazen Racing and I loved them. They had so much food to choose from at the finish from Its It ice cream sandwiches to bagels to chips and cookies. The aid stations on the course were more often than most trail races. They had volunteers taking photos and posted them all to Picasa web albums for us to download at no cost. Overall a wonderful experience. Oh, and sweet medals! Women's specific v-neck tech shirts. A few more photos courtesy of the Brazen volunteers. I loved getting all of these! An uphill smile around mile 4. Enjoying some not so steep downhill. Unhappy later...this one makes me laugh. The photos are great, despite it being a tough race. Cute shirt, too! I would love to do a trail race some time, but seems so intimidating! Thanks! It's super fun and more laid back than road - definitely check it out! Even if it's hard, lots of people walk and go much slower than road pace. Congratulations, we've all had those tough, disappointing races. Just go back next year, and get a huge PR for the course! Brazen is the best! They do great events. I love this shirt and medal. You look really happy despite the hard course. Trail running is just so different - you never know what to expect but you did great. Congratulations! Yeah so impressed with Brazen! And you got names on the bibs! You seem to have so many cool races nearby! Most trail races out here are small without any chip timing/medals/etc. Still fun with a cozy feel (pizza and pb&js! ), but I'd love some more big races. Awesome photos and a great medal too! Looks like a great day and you look super fit and happy! 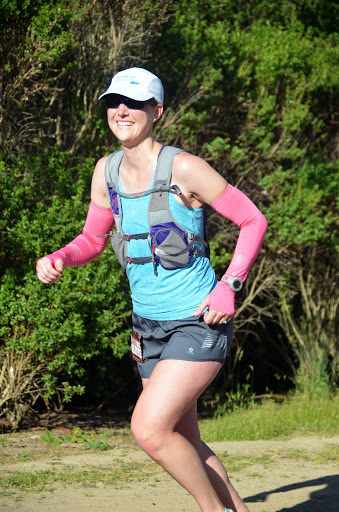 I'll be happy if I make 3 hours in my first trail half (yeah, I skipped straight to trail 50k)...running incessant climbs can be so hard! What do you think of your hydration vest? I'm in the market for a new one. Do not fall! you might break your elbow!! In all seriousness... great job! I heard Wildcat was one of their tougher trail races [though they have a few tough courses] but love Brazen Racing. They usually get some great in action shots on the race. I think they got some great ones of you two. I also enjoy how so relaxed they make the racing day feel. Wow! That looks like a super fun race! Way to go! Awesome run Paulett! Trail races are like no others. Way to stick with it eventhough that photo with your hands on your hips makes me think your saying, "wildcat is f#$@! Up"!!!! blog in the near future but I'm having a tough time choosing between BlogEngine/Wordpress/B2evolution and Drupal. The reason I ask is because your layout seems different then most blogs and I'm looking for something unique.